Every so often, a family gets together to re-create some old family photos. Some of them go viral because they are absolutely hilarious! Pick a fun photo, get together with your siblings, and have some fun! Here are some tips for re-creating old family photos. First, the basics. In order to do this right, you need to do your best to match the family photo you want to re-create. Find clothing that is the same color as what everyone was wearing in the original photo. Try to get in the same positions as you were in the old photo. The best re-created family photos are the ones where people make the same facial expressions as were in the old one. Find a photo from early childhood. Infants tend to have a blank, or confused, expression in photos. They are too young to understand that their photo is being taken and that they are expected to smile. Toddlers often make very emotional expressions in photos – because toddlers don’t have any reason to hide how they feel. Re-creating those expressions, as adults, is going to look silly. Pick a photo with two or more people in it. It is possible to re-create an old family photo that only features one person. The best results come from re-created family photos that have several people in them. The more the merrier! Get together with your siblings, or your cousins, and choose an old photo together. 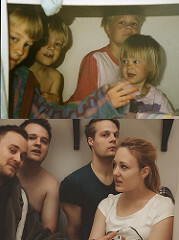 Part of the fun comes from laughing while trying to re-create that photo years later. For best results, set up the re-created photo in the same location that the original, old, photo was taken in. For example, if the old photo shows you and your siblings sitting on the stairs in your parent’s home, take the re-created photo on that same set of stairs. What if is not possible to go back to the location the old photo was taken in? Improvise as best you can. If the old photo was taken outside, make sure to take the re-created one outdoors, too. The most interesting photos are the ones where the people in them are doing something. Choose an old family photo where you, and the other family members in the photo, are active. These kinds of photos tell a story. It can be very amusing to see what the story looks like in the re-created photo!